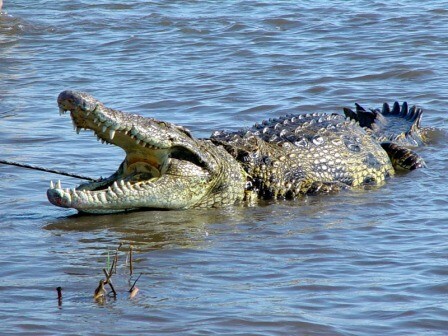 A 14 year old Malawian boy has died in Nkhatabay district after a crocodile attacked him when he was fishing in Lutupa River in the district. Police identified the deceased as Blessings Phiri who was a standard four pupil at Kachere primary school. Police spokesperson Ignasious Esau said the crocodile dragged the deceased into the river. “After his disappearance the community searched for him and they found his body which was found without legs,” said Esau. Phiri hailed from Iteta village Traditional Authority Fukamapiri in Nkhatabay district. Sad news,may his soul rest in peace. Rip Blessings but the explanation is simple poverty is to blame Crocodiles and human beings are fighting for survival, Over fishing is leaving Crocodiles with no choice . Fishing in Lifupa is very dangerous. Parents should not allow children to go fishing there. RIP Blessings. amalawi ambuye tithawire kt tawonane ifa njala mkhwala mzipatala zathu mlimbe malubino akuphedwa opanda chifukwa mtsogoleri wathu akutitukwana chifukwa ca uphawi wathu.madzi akuswa mangesi akuthimathima zithu zandura misika ikupya. Ena mukukulilapo umwale pa maliro amwana remember maliro sindale guys. Any way its one by one but different ways to go .young boy rest in peace…………..
Eeee okulakula mwana wapita, so sad..
Fellie try 2 write tangible issues,pliz! U want us 2 just laugh? my head anatomically looks bad, but what is contained in my cranium is better than what ur cranium is housing, dont inbox me again, lazy barain, lets argue on the wall if anything then dont respond, aplasia of the brain. RIP koma anthuni ng’ona imagwira pamtunda? African technology at its best. (like) samatanthauza mau amoz ai.pa fb amatanthauza zambiri. plz be like proper journalists-I felt like am reading the headline.